They know that they lack five votes to affirm the lower court’s version of the endorsement test – indeed, more than five sitting Justices have criticized that test. They also know that the legislative prayers in this case, which were delivered by volunteer Christians, Jews, Bahá’ís, and Wiccans, are far more inclusive than the prayers upheld in Marsh v. Chambers, which were delivered exclusively by a paid Presbyterian minister. Thus, they have decided that the only way to avoid a bad ruling on Marsh and the endorsement test is to aim for a dramatic expansion of the coercion test. 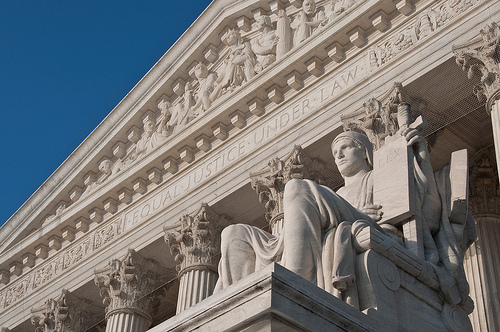 Professor Nelson Tebbe asks why the Solicitor General filed a brief siding with the Town that “aligns with the most permissive approach” to legislative prayer in the circuit courts. Lisa Soronen and I spoke in August at the National Conference of State Legislatures 2013 Legislative Summit on significant Supreme Court cases affecting State and local governments. The hand-out that Lisa prepared discussing 14 cases is here; my presentation is here. (4) Coming Soon: Can the Police Seize a Smartphone? Alison Frankel highlights an issue that the Court might address soon: can the police seize smartphones under the Fourth Amendment? The issue arises in two pending cert petitions: Riley v. California and United States v. Wurie.